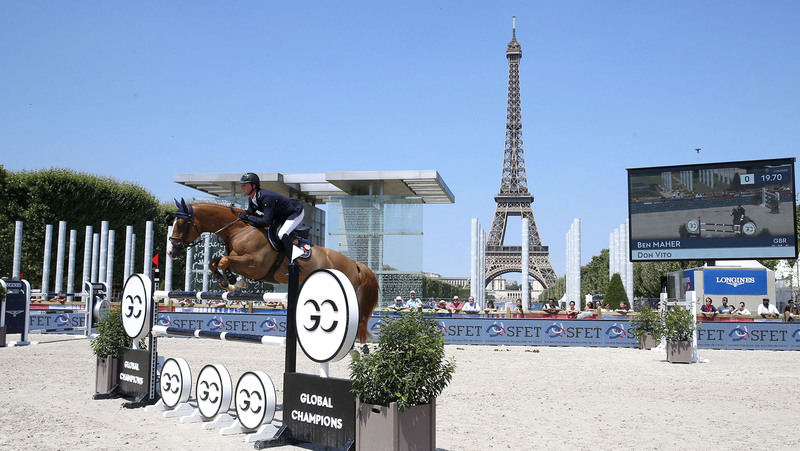 The second day of competition at the Longines Global Champions Tour - Longines Paris Eiffel Jumping kicked off with a blistering win in the CSI5* Prix Renault Mobility from Ben Maher (GBR) with Don Vito as temperatures rose in the French capital city. Set under the Eiffel Tower and with perfect blue skies, Maher took the 1.45/1.50m speed class win, finishing ahead of Leopold van Asten (NED) with VDL Groep Urane de Talma, and Laura Kraut (USA) with Whitney who took second and third respectively. Uliano Vezzani put together another testing course, utilising the intimate square arena Pathfinder Athina Onassis put in a steady clear with MHS Going Global, the pair putting in a tidy round but finishing outside the time allowed to collect two time faults. But there were plenty of hard luck stories, with Sheikh Ali Bin Khalid Al Thani (QAT) and Sirocco, Sadri Fegaier (FRA) with Come To Win, Sameh El Dhan (EGY) with Championes and Rene Lopez (COL) with Big Brother all picking up scores they’d rather forget today. Multiple Olympic gold medallist Ludger Beerbaum (GER) and Cool Down were the first to keep a completely clean score, setting the time to beat at 63.43s in today’s speed class. He was quickly surpassed by Laura Kraut (USA) with her top speed mare, the chestnut Whitney, the duo taking a second off the time to finish in 61.76s. While their time was good, they didn’t take any chances, and knew they’d left the door slightly ajar for the rest of the field to come. Home rider Philippe Rozier (FRA) and Reveur de Kergane put in a strong try, but finished 1 hundredth of a second behind Kraut, pushing through the gates in 61.77s to slip just behind the American. Ben Maher (GBR) blew away the rest of the field with Don Vito, picking up pace as they flew around the course. With the bit firmly in his teeth, Maher put the pedal to the medal with Don Vito responding effortlessly to gallop through the finish gates in an impressive 57.93s - raising the bar for the rest of the international field to come and putting the pressure on. Others to go clear were Marcus Ehning (GER) with Cornado NRW, Jérôme Guery (BEL) with Kel'Star du Vingt Ponts, Scott Brash (GBR) with Hello Jefferson, Leopold van Asten (NED) with VDL Groep Urane de Talma, Bassem Hassan Mohammed (QAT) with Argelith Squid and Denis Lynch (IRL) with Flying. But it would be another win for Ben Maher, his second of the weekend, with the British rider on phenomenal form at recent Longines Global Champions Tour events. The next class, the 1.55m jump off class at 18:00 local time.